The government earmarked Rs 750 crore for undertaking road repairs in several parts of the city including Greater Hyderabad Municipal Corporation (GHMC) area. The city can expect an infrastructure facelift in the quarters to come. State government has relaxed Transfer of Development Rights (TDR) norms for owners reluctant to part with their property for various infrastructure projects. As per the new rules, the government will issue a TDR certificate to the property owners, allowing them to construct additional built-up area anywhere in the city. The city awaits an infrastructure makeover of Rs 10,000 crore, which along with several industry-friendly policies in the direction of ‘ease of doing business’ will enable Hyderabad to remain an attractive investment destination. The 12-km long radial road connecting Nallagandla to Kolluru is being constructed in tandem with the Outer Ring Road (ORR). It will ease connectivity and boost emergence of new financial zones. Additionally, plans of extending the existing 1-km growth corridor around ORR to 2-km are also being considered to propel development. Telangana is set to have its first integrated township at Tellapur. Planned over 100 acres of land, the project has been approved to be developed jointly by Tellapur Techno-City Limited (TTPL) and Hyderabad Metropolitan Development Authority (HMDA) and is anticipated to spur real estate demand in the future. Recording the lowest inventory overhang of 25 months in the year 2017, amongst other metros, Hyderabad’s real estate market remained stable in the first quarter of 2018. Improved investor activity in Telangana on the back of healthy return on investment and enhanced sales in the city are testimony to the revival in home buying sentiment and market dynamics. Although the non-formation of a permanent authority under RERA remained a deterrent to growth, enquiries for inventory priced within Rs 40 lakh went slightly up. The capital ‘asks’, however, maintained status quo with the last quarter. Some popular localities in the West such as Manikonda, Madhapur and Kukatpally witnessed prices going north by modest margins, QoQ. The rental market remained upbeat on the back of lease renewals before year end and the impending infrastructure facelift. Developments such as Hyderabad Metro Rail, augmentation of road infrastructure and elevated corridors infused optimism amongst stakeholders. Additionally, the title of the ‘best Indian city to live in’ as per Mercer’s Quality of Living Ranking report also cheered the market. In order to expedite absorption of IT spaces in existing hubs such as Nanakramguda and Gachibowli, the government took additional initiatives towards boosting amenities and investment potential of these pockets. The city’s commercial segment posted a gross absorption of 5.8 million sq ft, accounting for 13 percent of the total office take up in 2017. Large funding by private equity firms such as Blackstone Group in the commercial sector is set to positively impact the residential sector as well. Affordable rentals and a robust supply pipeline is expected to bolster office leasing in Hyderabad. Hyderabad ended the first quarter of 2018 with nosediving sales and no change in average capital values. While homebuyers remained wary of parking their funds in real estate, spur in investor activity kept the market upbeat. New launches remained limited due to uncertainties over the formation of a regulatory body under RERA. Absence of a permanent regulator also dampened buyer sentiment, who turned to the rental segment as an alternative. While the city’s average weighted capital values did not observe any movement in Jan-Mar 2018 against the previous quarter, Manikonda ruled the capital charts recording a growth of three percent, QoQ. Locational edge, proximity to the IT corridor and self-sufficient infrastructure attributed to the growth. 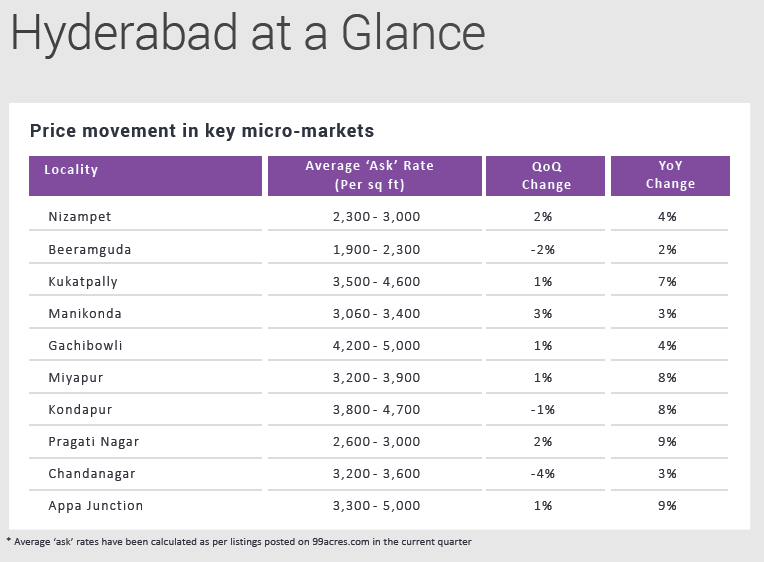 Key micro-markets including Miyapur, Kukatpally, Boduppal and Nagole continued to attract end-users primarily on the back of enhanced connectivity via unveiling of the Miyapur-Nagole stretch of the Hyderabad metro, nearness to employment hubs and availability of affordable properties. These localities saw capital ‘asks’ surging by 1-2 percent, each, QoQ. New launches came to a standstill due to inordinate delays in setting up of the RERA portal and persistent ambiguity over GST. Besides, delay on part of the Greater Hyderabad Municipal Corporation (GHMC) to grant building approvals further acted as an impediment to the city’s real estate growth resulting in subdued buyer sentiment. Amidst the slowdown in the capital market, the rental landscape remained robust in some parts of the city, pushing average rental values up by two percent, YoY. Maximum leasing activity was recorded in the most prominent office corridors of the city located in the western quadrant. 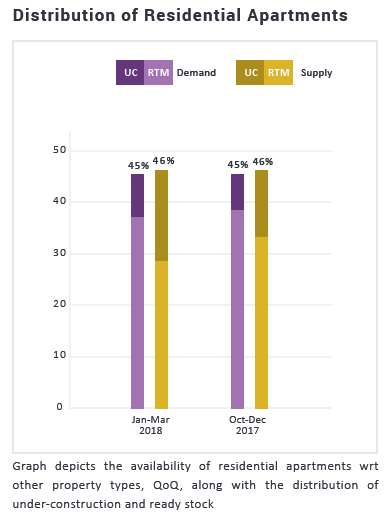 Continuous commercial development, high office space occupancy rate, growing demand and improved connectivity to prime areas on the back of the recently launched metro helped the rental market see steady traction. Localities such as Kukatpally, Appa Junction and Kondapur caught the interest of the tenant community and observed increment in rental ‘asks’ to the tune of 7-11 percent, YoY. The saturated markets of Gachibowli and Begumpet continued to flounder with extreme traffic congestion and other civic issues including ground water depletion and clogged drains leading to high vacancy levels and six and four percent drop in rental values, YoY, respectively. While new supply remained restricted, demand skewed further towards ready properties in affordable and mid-income housing segments. Enquiries witnessed some momentum but were not able to lift sales volume by a notable margin. Unsold inventory remained at almost 36,000 units and a reduction is dependent on the setting up of a permanent regulatory authority in the ensuing quarters. The overall demand for residential apartments in Hyderabad remained unaltered in Jan-Mar 2018 against the previous quarter. Supply witnessed marginal variations across different property types. Despite the absence of newly launched projects, supply of under-construction apartments rose by over 10 percent due to an influx of resale units in the market. Owner’s intention to dissolve their investments was highly evident. Like other metros, the affordable housing category (within Rs 25 lakh) continued to drive maximum demand in Hyderabad. A reduction in the applicable GST rates from an effective 12 percent to eight percent for homes purchased under the CLSS-PMAY (Credit Linked Subsidy Scheme-Pradhan Mantri Awas Yojana) also pushed its preference among the buyer community. The supply of such units, however, fell short of its demand by close to 10 percent. In tune with previous quarters, supply outstripped demand by 17 percent in the luxury segment (Rs 60 lakh - Rs 1 crore), depicting a waning appetite for premium homes in the city.